Here is another recipe for the Central England Co-op’s Easy Eating Campaign! It is indeed easy to make and packed with goodness! 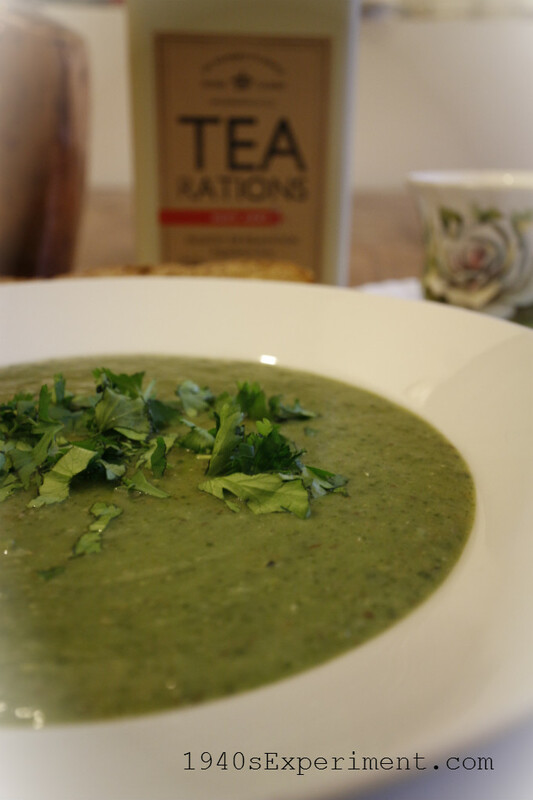 Yes it does come out a lovely shade of green… much like a savoury green smoothie! A whole bags worth of Kale went into this soup which made enough for six people served with bread. I know it tastes good as Mr Tiddles (Richard) gobbled his down when he came over for supper – I was WELL impressed! 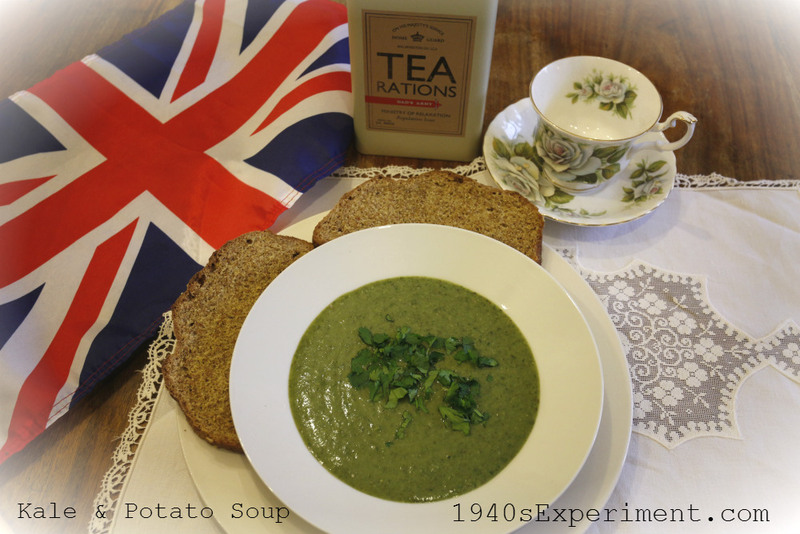 So here is the recipe for wartime ‘Kale and Potato Soup’ which comes from The Ministry of Food’s wartime leaflet No 15, ‘Easy to Make Soups and Broths’. Put half the vegetable stock into a large pan, bring to boil and add the chopped onion/leek and potato and cook until vegetables are soft then mash everything up together. 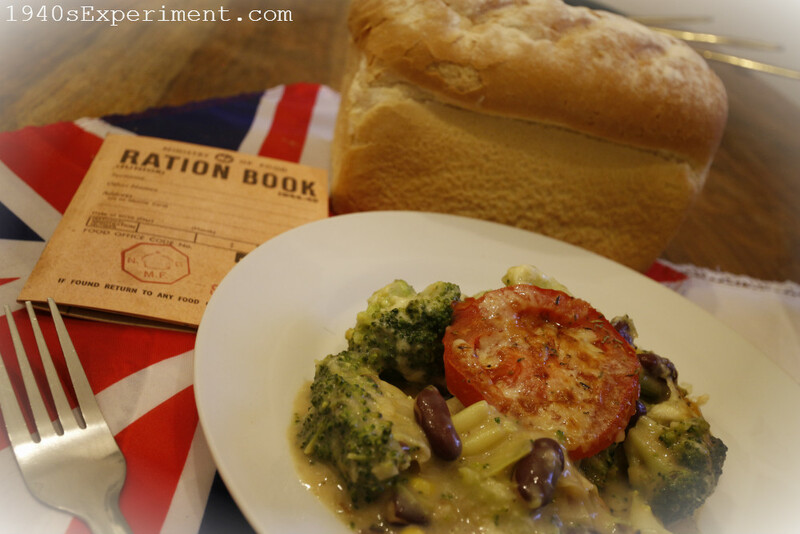 In support of the Central England Co-op’s Easy Eating Campaign I’m making a few wartime recipes to promote simple, easy food and support food bloggers in the UK. 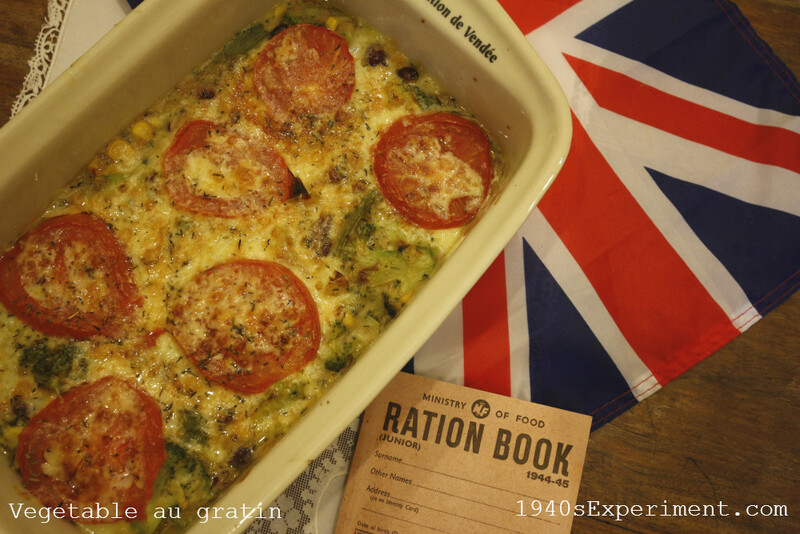 The first recipe is a simple, inexpensive, veggie meal, using fresh food from the Co-op, taken from the wartime Ministry of Foods Cheese leaflet No 12… Vegetable au Gratin. Richard (Mr Tiddles) and I recently spent four days in France in La Rochelle. One day we popped into a small little shop tucked down one of the back streets, to buy some bread, cheese and wine (we heard you have to do that in France so we did). I think the shop keeper loved Richard and his beard, he called his wife down for a chat (they lived over the top of the shop) and he gave Richard a free big pottery dish which we gratefully took away with us back to the UK. 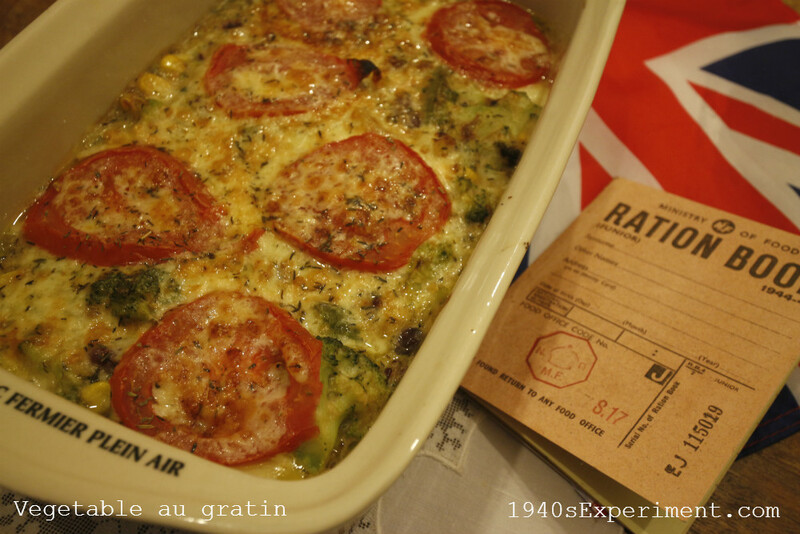 Seeing the wartime recipe for ‘Vegetables au Gratin’ I just had to use the dish (which by the way says on it ‘Tradition de Vendee – Porc Fermier Plein Air’ and if you know what that translates to I’d be ever so grateful if you could share your linguistic wisdom). So here is ‘Vegetable au Gratin’ served in a French dish that travelled all the way back from France in Richard’s backpack. It’s simple, tasty, and economical.. ENJOY! Put the remaining liquid in a pan and bring to the boil. This dish serves 4 – 6 people and using ingredients from the Co-op it cost £3.50 to make.